Home The NewsMill If Art 370 goes, India’s Kashmir story ends: Mehbooba. If Art 370 goes, India’s Kashmir story ends: Mehbooba. 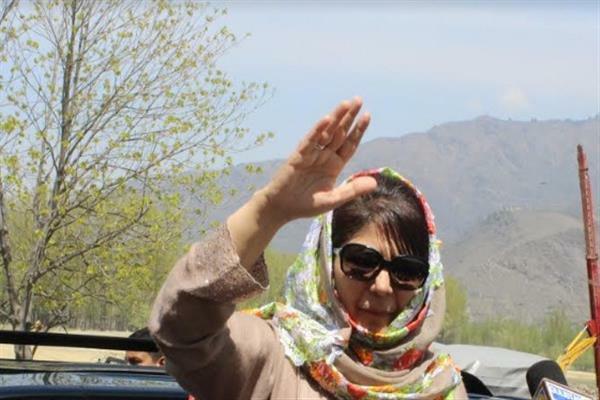 Peoples Democratic Party (PDP) President Mehbooba Mufti Monday said India’s story in Kashmir would come to an abrupt end if Article 370 or Article 35-A are revoked. “Why waste time in court. Wait for BJP to scrap Article 370. It will automatically debar us from fighting elections since Indian constitution won’t be applicable to J&K anymore. Na samjho gay tou mit jaouge aye Hindustan walo. Tumhari dastaan tak bhi na hogi dastaano main (sic),” Mehbooba tweeted responding to a PIL moved in the Delhi High Court to ban her and three-time chief minister Farooq Abdullah from 2019 Lok Sabha polls. The PDP chief also said if Article 370 and Article 35-A are revoked as promised by the rightwing Bharatiya Janata Party then not only Kashmir but entire India along with the entire region would burn. “J&K is already sitting on a pile of ammunition to which BJP is trying to act as ignition. I warn BJP to please stop playing with fire,” she wrote on Twitter while reacting to the rightwing party’s manifesto promising revocation of Article 370 and Article 35-A. Mehbooba said when BJP would free J&K from Article 370 it would also free the State from India. “They (BJP) are pushing the people of J&K toward the 70-year-old political demand by issuing such statements,” the PDP President said. She said if BJP wants to put her in jail or lodge a case against her it would not bother her because speaking in support of Article 370’s protection or for talks with Pakistan was a legitimate demand. “PDP has been consistent. We never asked for carpet bombing of Azad Kashmir or drowning of Hurriyat leaders in Jhelum like some parties,” Mehbooba said. She said instead of wasting time in the court, BJP should scrap Article 370 which would automatically debar them from fighting polls since Indian constitution would not be applicable to J&K anymore. On Monday, BJP in its 2019 general election manifesto promised revocation of Articles 370 and Article 35-A. “We reiterate our position since the time of the Jan Sangh to the abrogation of Article-370. We are committed to annulling Article 35-A of the Constitution of India as the provision is discriminatory against non-permanent residents and women of Jammu and Kashmir,” the BJP manifesto tiled Sankalpatr reads. “We believe that Article 35-A is an obstacle in the development of the State,” the BJP manifesto stated. Previous articleArmy refuses to ply convoys only on Sundays, Wednesdays.